It’s not at all “just” for the birds. It’s not “just” for any one thing. It’s for Angus, whose rapturous pursuit of birds expresses the epitome of equivocal desire: his instincts draw him toward birds, but he knows I’m also interested and – because he checks on where I am, even when he’s birdy – wants to involve me in his game. It’s for Leslie, who does not hunt and does not kill but is drawn by her awe of Angus’ abilities (athletic, olfactory, instinctual) and her love of connecting with landscapes unavailable any other way, despite her abhorrence of watching birds getting murdered. It’s for the getting-lostness of it, for the forgettingness of it, and what I get from that mental negative space in spectacularly positive physical space. It’s for putting meat in the freezer. It’s for dealing with unmet expectations. It’s for practicing grace in an imperfect world. And it’s for a lot of other stuff, good, bad, and unknown. It keeps us all going. We wish you peace, luck, and joy, and not just for 2015. I just found your website a couple of weeks ago from Youtube. 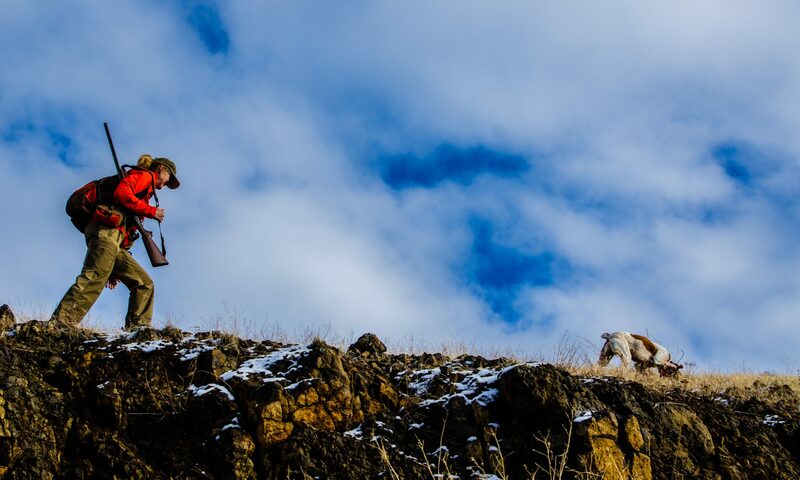 I really appreciate it because unless you hunt Chukar it is hard to explain to someone why you would walk up steep mountains to find birds. I always tell them it is all about the dog and the work you put in with them. I am new to the Idaho and I was wondering if you have hunted much at Brownlee? I have been told to go there, if you have been there, have you had much luck there this year? Perfect. I took the day off to dog sit a friends hunting dog and his 9 week old pup. It was a fun day but after reading your blog and watching the video I know where I should have been. Good for you for taking care of a buddy’s best friends. It’s a generous service for such an intrepid hunter as yourself. I wonder how Jake’s taking the forced time off! Have been enjoying your blogs and Leslie’s photography all year. Thanks for sharing! Bob love your blog! Just wanted to share a picture of my son, Aaron and our two dogs, jack an 8 year old Vizsla and Danner our 9 month old Brittany. The pheasant was pointed and retrieved by the pup, Danner. Thanks, Marc! I’d love to see the photo… (not sure if you can attach it in a comment)… We’re thinking of getting a pup in the spring (don’t tell Angus! ).